After many requests for vegan poutine, it’s finally here! Without further ado, let’s jump into it! This recipe requires 10 ingredients and about 1 hour to prepare (once your cheese is made!). The base, of course, is crispy baked fries! I discovered that cooking the fries in a bit of oil on parchment paper allowed them to get crispy on the outside and tender on the inside without ever sticking to the pan. While your fries cook, it’s gravy time. For my gravy, I went with a mix of mushroom and shallot for flavor and heartiness, cornstarch or arrowroot to thicken, almond milk and vegetable stock to thin and add more flavor, and plenty of salt, pepper, and a dash of vinegar and coconut aminos to bring more depth of flavor. I did a lot of testing and research when it came to gravy, and this by far was my favorite! I hope you enjoy it as much as we did. All that’s left to do is add cheese, brown in the oven, and top with gravy! Traditional poutine doesn’t require the cheese curd to be cooked, but my version isn’t traditional – it’s vegan, after all. Plus, the Vegan Mozzarella Cheese “curds” taste best when they’ve got a little a little color on them! And who wouldn’t want melty, gooey cheese on their fries? This is the perfect dish to enjoy on game days, on chilly fall and winter evenings, or when you’re craving a hearty appetizer or snack. I think these puppies are delicious on their own, but they would also pair well with a cold beer or white wine sangria (obviously), my Garlicky Kale Salad with Crispy Chickpeas, Easy Grillable Veggie Burger, or Vegan ‘Pulled Pork’ Sandwich. If you try this recipe, let us know how it goes! Leave a comment, rate it, and don’t forget to tag a photo #minimalistbaker on Instagram. Cheers, friends! 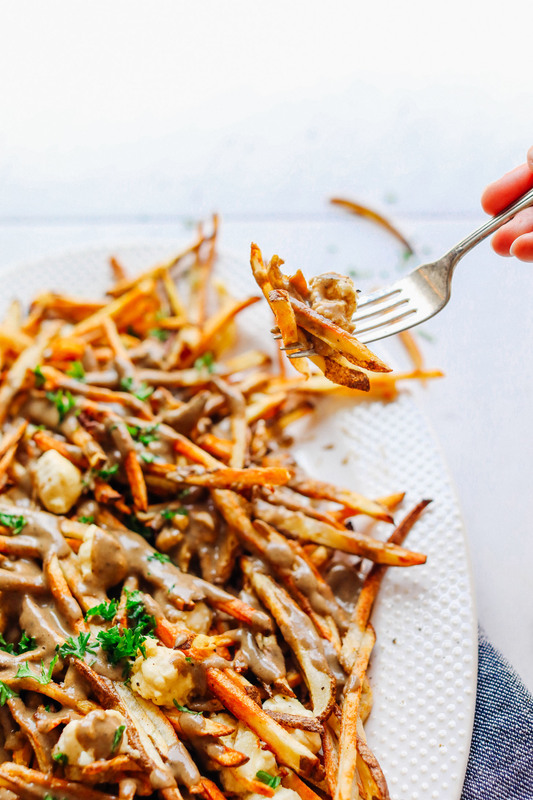 Vegan poutine with crispy potatoes, savory mushroom gravy, and melty vegan cheese curds! The perfect plant-based alternative to this Canadian classic. FRIES: Preheat oven to 450 degrees F (232 C) and chop potatoes into thin slices by halving lengthwise then cutting into wedges and then strips. For “wedges,” cut into larger pieces - both work the same, but matchsticks cook faster. Line two large baking sheets with parchment paper (amount as original recipe is written // use fewer or more pans if altering batch size). Add fries, oil (see notes for substitution), and salt and toss to coat. Then arrange fries in a single layer, making sure they aren’t overlapping too much. This will help them crisp up and cook evenly. Bake for a total of 25-35 minutes, tossing/flipping at least once to ensure even baking. When the fries are finished, remove from oven and set aside. 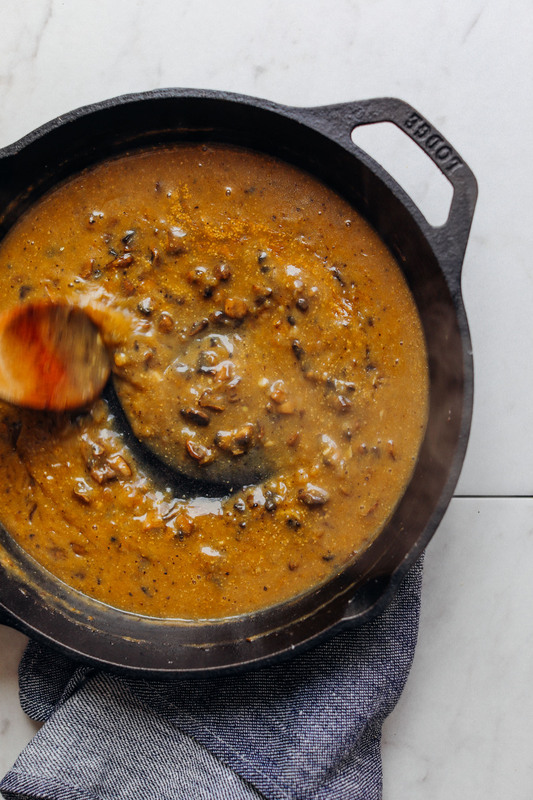 GRAVY: While fries are baking, prepare gravy by heating a rimmed skillet over medium heat. Once hot, add oil (or water) and shallots. Sauté for 2-3 minutes, stirring occasionally. Then add mushrooms, salt, pepper, balsamic vinegar, and coconut aminos (optional). Stir and increase heat to medium high to brown the mushrooms. Cook for 4-5 minutes or until they are slightly caramelized. Then add the cornstarch and stir to coat. It should look dry at this point - that’s OK.
Lower heat to low and slowly add the broth and almond milk while whisking. It should resemble gravy pretty quickly and should bubble and thicken as it cooks. Cook for 4-5 minutes, or until you've reached the desired consistency. Add broth or almond milk to thin if it becomes too thick. Transfer to a blender and blend until smooth (optional but recommended). Taste and adjust flavor as needed, adding more salt and pepper to taste or more Worcestershire or coconut aminos for more depth of flavor. See notes for other additions if you desire more depth of flavor. Return gravy to stovetop and heat on lowest heat to keep warm. 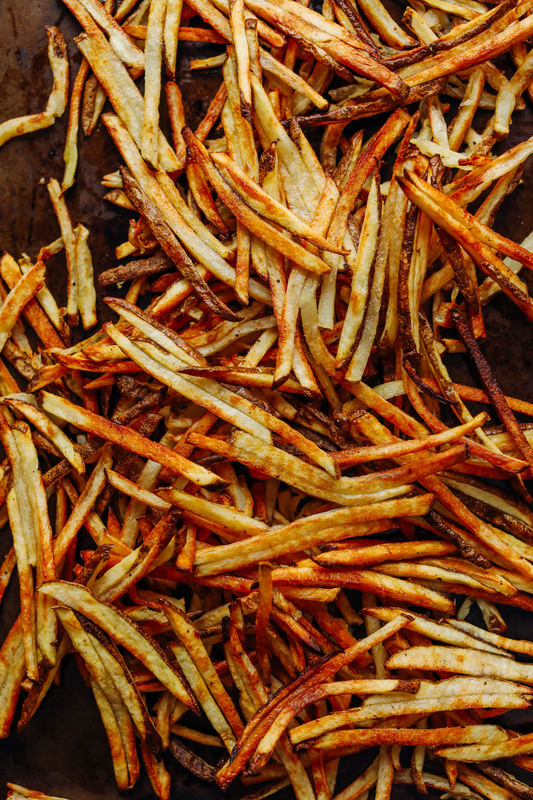 FOR SERVING: Add all of the baked fries to one baking sheet. Then divide the Vegan Mozzarella Cheese into 1 tsp "curds" and add to the baked fries (I used just shy of 1 batch of the recipe). Then place fries back in oven on the top rack on medium-to-low broil so the cheese can melt and get slightly browned. Watch carefully so the fries don't burn - 3-5 minutes. Pour the gravy over top and dig in! This is a dish best enjoyed fresh! However, the cheese will store separately in the fridge up to 10 days (see notes for other uses). The gravy will keep in the refrigerator up to 5 days (reheat on stovetop for best results - add more almond milk or broth to thin if thickened), and the fries will store for 2-3 days (reheat in oven at 350 degrees F (176 C) for best results). *FRIES: If avoiding oil, first steam your potatoes in a large steamer basket (covered) until almost tender - about 10 minutes. Then arrange on parchment-lined baking sheets and season with salt. Bake at 400 degrees F (204 C) until slightly golden brown - about 15 minutes. The fries won’t be as crispy, but they'll still be delicious. *GRAVY: For more flavor, other additions might include a little nutritional yeast and/or maple syrup. *Based on my research, ketchup seemed to be a fairly common addition to poutine gravy. However, the idea of ketchup in gravy weirded me out. I tried it and didn’t like it. I found balsamic vinegar, coconut aminos, and a touch of Worcestershire to strike a good flavor balance. *CHEESE: If you have leftover cheese, it can be used on things like sandwiches, caprese salads, pasta bakes, breadsticks, or pizza! *Nutrition information is a rough estimate for 1 of 6 servings with all of the suggested oil, all of the gravy, and all of the vegan cheese. Another recipe from this blog that I made and that was super yummy (even thought I managed to burn fries a bit). I made fries from potatoes, carrots and parsley (cleaning the fridge :) ). For the gravy I used button mushrooms and dried wild mushrooms (soaked) and had to sub a bit (no time to make broth and had no worcestershire sauce so I used vegemite with water (happen to have a jar) and teriyaki sauce. And rosemary just because I love rosemary with mushrooms. And it was delicious!!! Thanks! I made this to bring to my “apres ski” themed cooking club… no one eats plant based except for me. It was a hit with all! (And my husband and daughter loved it too). I will be making it again. Thank you! Does this gravy freeze well? I am so excited to try this!!! Hi Marina! You can freeze the gravy, but not the rest of the dish. Store completely cooled leftovers covered in the freezer up to 1 month. Reheat in a saucepan until hot and bubbly, adding more vegetable broth to thin as needed. Hope this helps! I made this recipe for tonight’s dinner and it was actually my first time making vegan poutine at home, and I must say that this recipe is fantastic! It’s actually even better than some vegan poutine that I’ve had at restaurants! Will definitely do it again, thank you! Made this for my sister and brother in law last night. They LOVED it! They’ve both recently made a serious choice to go vegan/whole foods for health reasons. 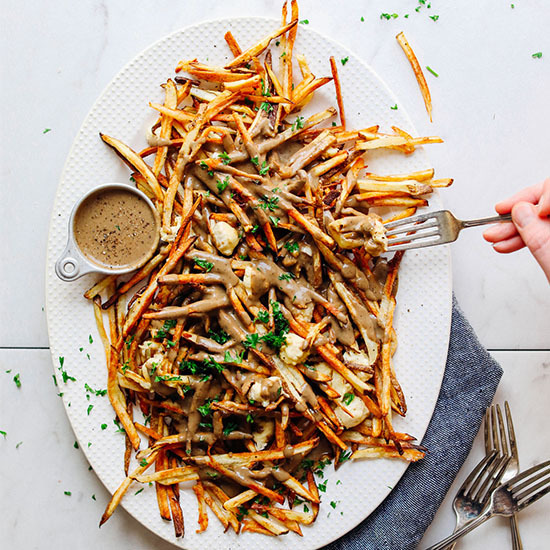 I didn’t do the fries from scratch (as we had a houseful of folks over for a family poutine party) but I’ve passed on this recipe to them and they will probably try your suggestions for steaming/baking the fries as they’re doing their best to avoid oils. Your site is wonderful and creative! I’ve never used tapioca starch before but now that I’ve seen it in action, I can’t wait to try out another “cheesy” recipe again soon! Made this yesterday and it was fabulous! The gravy is delicious. It is a definite do again and soon. Great great recipe! The cheese curds used on poutine aren’t really supposed to melt and become too gooey. Firm tofu soaked in lemon juice for an hour makes a pretty good squeaky substitute! My husband is new to Canada and loves poutine! That said, we have been trying to go 100% vegan for the past year without success mostly because we are having trouble giving up some of our favorite things. I cannot wait to make this for him, it is going to blow his mind!!!! Thank you so much, Dana. We love your recipes so much, they are always easy and delicious. They have really helped us transition. Here’s to a 2018 at 100%!!! I can’t wait to try the gravy recipe tonight! I am going to put it on my mashed potatoes and vegetable wellington on Thanksgiving! I forgot to ask, what brand of unsweetened almond milk do you use? I tried one or two brands and they were still sort of sweet.. I am also going to sub in vegan butter instead of coconut oil. I was just lamenting to a friend the other day that the only thing I miss about eating meat is poutine. I found your blog because I have recently started a vegan diet after years as a vegetarian and thought I should do some online research. YOU HAVE VEGAN POUTINE! Thanks for putting in the time to figure it out. It’s a delicious recipe. Sure, it’s not “traditional” poutine, but it more than scratches the itch. So I didn’t make the poutine but I used the gravy recipe with extra mushrooms for dinner tonight alongside some leek and spinach mashed potatoes and mixed vegetables – so delicious! This is such an amazing savoury gravy that I will certainly make again. Thank you for this! also fyi whole foods 365 worcestershire sauce is vegan and gf for anyone having trouble finding some! Thank you for the Poutine. I was worried about all the mushrooms because I really don’t like them. My husband loves mushrooms, and said I should try the recipe! Surprisingly I really like the poutine with all the mushrooms! I guess I am starting to enjoy mushrooms! thank you! Although we are what my daughter calls “Flexitarians”, I believe that finding delicious Vegan recipes is going to be vital in the future. I think giving them names of traditional recipes will help more people experiment with eating less animal products. We also loved your Crispy Eggplant strips, and I made some delicious sandwiches combining them with the Savoury Potato Carrot Mash, but I don’t think that would attract non Vegetarian/Vegans to try them. However Vegan Cheese and Bacon salad sandwiches might pique their curiosity!!! I just got a bag of shiitake mushrooms in my produce box this week and was wondering if that would work for the gravy instead of button or creminis? Love your recipes so can’t wait to try this. Thanks! Hilarious…my husband asked me just this week if a vegan poutine existed and I said I don’t think so dear….will definitely try this! I made this tonight and it was so good! [Disclaimer: I actually used Smitten Kitchen’s recipe for baked fries and I used a different recipe for the vegan mozzarella because I didn’t have all of the ingredients to make yours. I did make the gravy as written and I’m fairly confident that what I ended up with is very close to your recipe.] 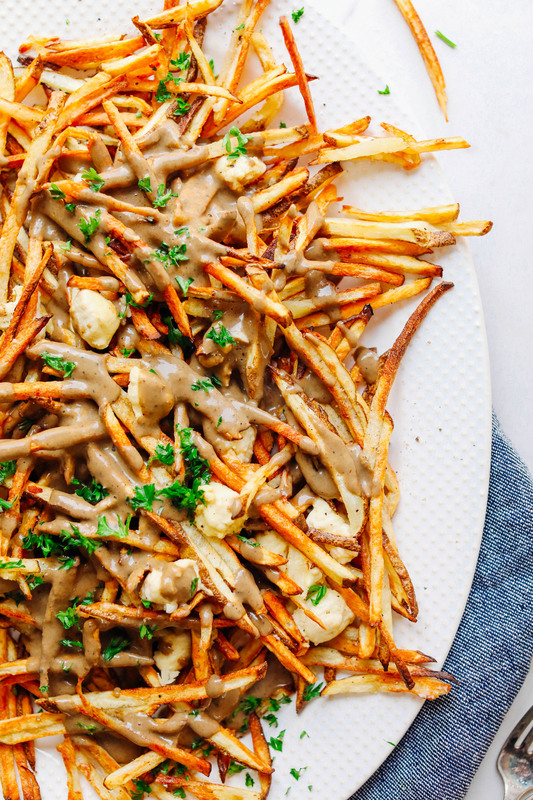 I’ve never had real poutine, so I have no idea if this recipe is anywhere close to authentic, but I really don’t care because this is vegan comfort food at its finest. Just FYI, I made it as a main dish. I would say the recipe makes 4 main dishes but, if I’m hungry, I could eat it as 3 servings. Six servings is likely reasonable for less glutinous servings as a side dish. Okay so we made this last night! YUM! I did not have a chance to make the coconut yogurt so in the cheese recipe, I just used the coconut milk (from can) 1/4 cup, the thick part, and then added water – about 1/2 cup. I think the tanginess of the actual coconut yogurt would have worked better – BUT, it was still DELICIOUS on top of the fries. As an aside, I used arrowroot powder as I didn’t have any tapioca left and it worked quite well. LOVED the gravy – didn’t have the coconut aminos so used a little extra balsamic. A really GREAT recipe, good flavours too! The mushroom gravy was awesome – didn’t expect that! Thanks so much – always get such great results with your recipes!!!! Was so delicious and a big hit! Definitely will be using that gravy in the upcoming holiday season. I just made this for dinner last night (no shame – we had salad, too) and it blew us away! The gravy is totally out of this world. It will definitely become my go-to vegan gravy recipe. Thanks for yet another amazing recipe! Oh Canada! Living in Australia means no poutine for us Canucks :( I couldn’t wait to try and this recipe like every.single.one from Minimalist Baker, it did not disappoint! Or as the Aussies say ” it was heaps good!” I had to use regular mozzarella as we are in the outback and vegan anything is hard to find- but I did just see a recipe for it!? (is there anything you can’t do Dana!?) Thanks for another delicious recipe! Sending love and so much appreciation from your biggest Can-Aussie fan! I’m really hoping the Montrealers here are joking… that being said, I’m from western Canada, so maybe if I tried a true poutine, I’d be saying the same thing. Glad I could give you a boost! I’ve noticed some negativity in the comments here lately and I personally think it’s uncalled for. You are amazing! Keep doing your thing girlfriend!! I was totally thinking the same thing! There are many versions of foods that originate from all over the world…pizza, pasta, perogies, tacos, pad thai…etc, etc. But we still call all those versions their original name. Gluten-free, dairy free, vegan and all! I enjoy experimenting with different flavours and variations of original recipes and am looking forward to trying this one out! The idea for using sweet potatoes is a great idea! I’ll have to try that, too! I have to agree. As a vegan who used to not be a vegan, I am always looking for alternatives to my favourite comfort foods. This looks amazing to me. I can’t wait to try it. Zero complaints about the authenticity of the alterations from me… this is how vegans eat and we need brilliant people who experiment with food to help us out, like Dana. Thanks Dana, for all the effort you’ve put in to your ideas to bring them to us! I was thinking the same thing…I’m from Montreal and I am a poutine addict ? Ok..The real poutine is different but come on! Every year we have a poutine festival and there is like so many different kind of poutines like Italian poutine, middle eastern, bacon, taco poutine, duck ect. There will always be negative people out there…So, thank you so much for all your hardwork in your recipes , I will certainly try it this one soon, it looks ? delicious! I love all things potatoes so this was a must try. Mozzarella turned out nice, but didn’t have much taste to it. But the gravy! Oh, the gravy. SO good. Right? The poutine should be in quotation marks. This was verry tasty, although I do wish your recipes were based on smaller portions. I almost always have to cut them in half or thirds, and it is kind of a pain to calculate reductions during preparation. Fried potatoes aren’t the best reheated and this makes way too much for 2 or 3 people to eat in one sitting. But the dish itself was really good and I will also probably try it with sweet potatoes. I’ve always wanted to make a vegan pouting, but I guess you beat me to it! Definitely want to try making a sweet potato version of poutine. Yummy! I made this last nite with minimal changes, paired with moscao. My non vegan husband and I (vegan) absolutely loved it! It was so wonderful we are going to make it for our green bay packer game day get togethers! You do NOT use skinny fries with poutine! How can you get the gravy and cheese in your mouth with skinny fries? Nope nope nope. Gotta use at least a standard cut, if not chunky. Balsamic in the gravy is interesting! I think it could also probably benefit from a touch of miso (though I am on a huge miso kick lately, so my opinion may be coming from that). haha, I think wedges would be awesome here, too! Included a mention of that in the instructions. 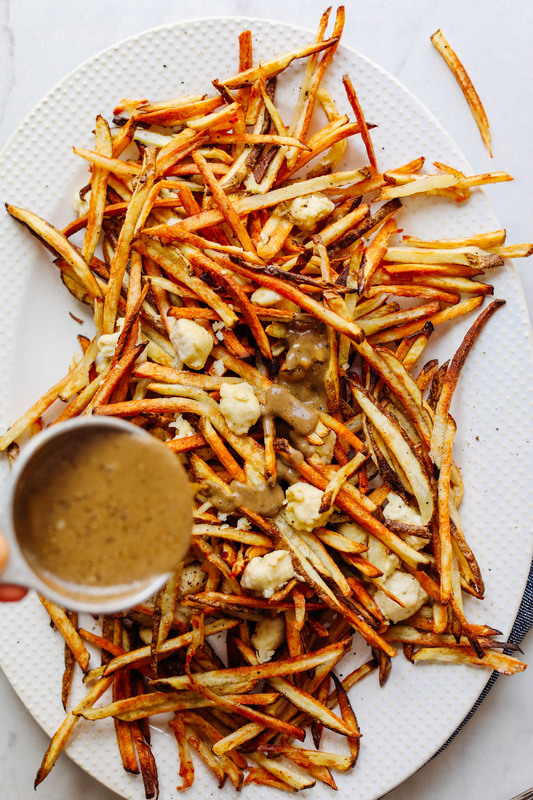 …just eat skinny fries by the moderate handful and they’ll scoop up the sauce just fine, imo. I need your help, I love your recipes I have your cookbook and I trust your advice. In a couple of weeks I have to prepare Thanksgiving dinner for my family. My husband and I have recently become vegans and we wish to prepare a full vegan dinner. Would you consider giving me some ideas on what recipes I could use. Thank you so much and please keep the recipes coming we love them. Google something like “vegan thanksgiving recipe roundup” and you will have loads to choose from (I bet Dana has done one ?). Some of the standard things are easy enough to veganize without much help – mashed potatoes, Brussels sprouts, the like. Do you want to do something to directly replace a turkey, like a stuffed seitan roast? Or are you open to ideas that are less typical, like savoury pies? Yes I do op open anything. The pies sound interesting, especially if they include some of the usual spices, sage, rosemary, all the fall flavours. Thanks for sharing that! We’ll also be sharing another round up and more holiday recipes in the coming months. Poutine is a french-canadian traditional meal in the province of Quebec, in Canada. It is french fries with gravy and cheese. But even if it looks easy like this, the purrrrrfect poutine is hard to find. Montreal area and Saguenay-Lac-Saint-Jean are the best places to find good poutine. I live in Quebec city since a few years now, and they absolutely can’t do a good gravy matching with the fries and cheese. Fun fact: whatever how bad you feel, poutine always brings you back in a good mood. A stomach that burns because of the greasiness of the meal, but in a good mood anyway. Poutine is like magic. Doing an excellent poutine is an art. And poutine is a state of mind. As a Montrealer, this is the worst form of cultural appropriation I have seen! Poutine is not Poutine without cheese curds. Poutine is not gourmet and Poutine is certainly not vegan. That being said, this looks like a delicious plate of fries and gravy! Going to try it soon. Hi there! Thanks for the feedback. I did include vegan cheese curds in the recipe. And keep in mind, this is an inspired version! Perhaps a more traditional recipe is better suited for you. Yay! Thanks for the kind words, Sara! As a Montréalaise, I say: give us a break with cultural appropriation. What she did is a vegan adaptation and I can’t wait to try it. Have a mushroom free option? Mushrooms are? I’ve successfully made a modified version of this recipe vegan: http://www.foodnetwork.com/recipes/ina-garten/homemade-gravy-recipe-1940501. Just substitute vegan butter or oil, vegetable broth and leave out the cream. I recommend reducing the amount of vegan butter and blending before serving. 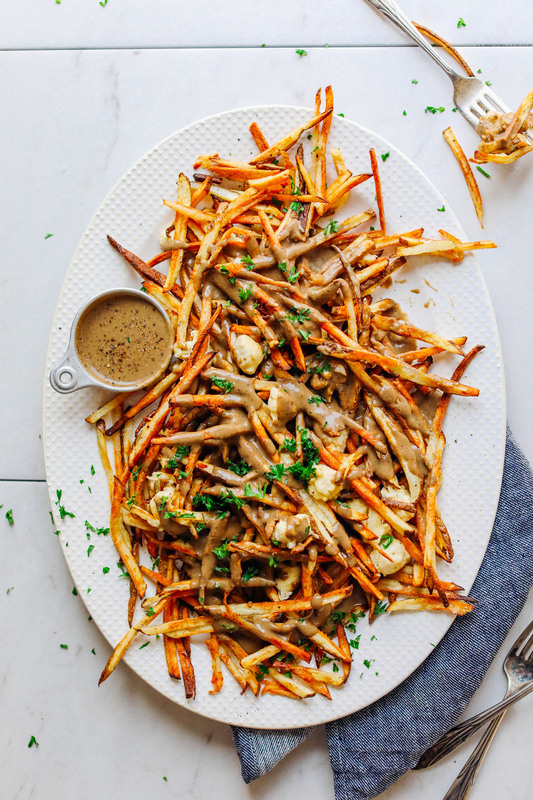 I have never heard of this dish, but anything with potatoes / fries COUNT ME IN!!! I will be trying this dish ASAP! P.S Is there another gravy recipe on the website?